The Long History Of The Gaza Tunnels : Parallels Alexander the Great complained about the tunnels under Gaza during his siege of the area in 332 BC. They are still an issue today as the Israelis and Palestinians slug it out. An Israeli army officer on Friday shows journalists a Palestinian tunnel that runs from the Gaza Strip into Israel. Israel says its current military campaign is aimed at destroying the tunnels. During the current round of fighting in the Gaza Strip, Kareem, a 40-year-old Palestinian, witnessed a Hamas tunnel exposed. "There is a chicken coop near us," said Kareem, who lives on the eastern edge of Gaza City, bordering on farmland. "We know it's a chicken coop." But an Israeli attack, which destroyed the chicken house, revealed a tunnel heading east toward Israel, he said. "We didn't know about it, but we faced a risk because of it," he said. More than a risk. The Shejaiya neighborhood where he lives was the target of first Israeli airstrikes, then intense shelling shortly after the ground invasion started. Thousands of Gazans fled their homes. The last word Kareem heard from neighbors who left after him was that his house, from where he used to be able to see the chicken coop, had been badly damaged, if not destroyed. The Israeli military called Shejaiya "reknowned for terrorist activity" and said troops encountered significant resistance from militant fighters there. This week, the military published a map showing six tunnels beginning in Shejaiya snaking under the double fence at the border, and into Israel. This is one area Israeli leaders would likely try to keep troops on the ground as long as they are able, even during a ceasefire, to shut down militant activity, including tunnels. "We're not willing for [Hamas] to come and meet us in our backyard," said IDF spokesman Peter Lerner. "We want to meet them in theirs." Overall, Israel says it's found more than 30 tunnels in Gaza since the fighting began. 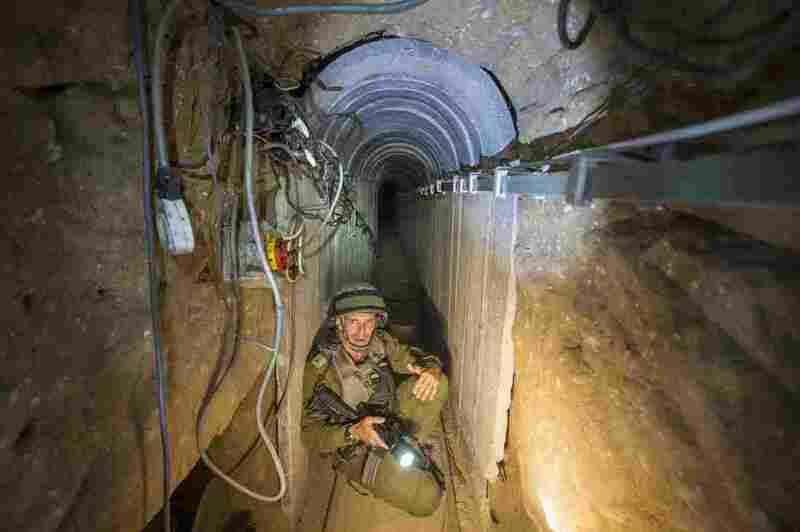 Israel certainly had been aware of Gaza tunnels before this war. First, it's an ancient practice. In his forthcoming book, Gaza: A History, Jean-Pierre Filiu describes the "first historic reference to the loose subsoil of Gaza" during Alexander the Great's 332 BC siege of this Mediterranean city, then under Persian rule. Filiu writes that Alexander expected quick victory. But "the siege of Gaza involved 100 days of fruitless attacks and tunneling." When Gaza finally fell, Alexander was infuriated and went on a vengeful rampage. In more recent times, Palestinians subverted Israeli controls over travel, imports and exports to and from the Gaza Strip by digging tunnels to south, into Egypt. Cars, cows, and cigarettes came through what were commonly called smuggling tunnels, although Hamas taxed what it could after it came to power 2006. Cheap Egyptian gasoline kept Gaza going when Israel fuel was too expensive. Weapons and sometimes people travelled through those commercial tunnels too. Hamas also used a tunnel from Gaza to enter Israel and kidnap an Israeli soldier, Gilad Shalit, in 2006. He was held for five years, until Israel agreed to free more than 1,000 Palestinian prisoners. The tunnels to Egypt have been largely shut down in the past year, following the ouster of Egyptian leader Mohammed Morsi, whose Muslim Brotherhood was sympathetic to Hamas. Under the current Egyptian President, Abdel Fattah el-Sisi, Egypt has bulldozed those tunnels, stifling the already weak Gazan economy. 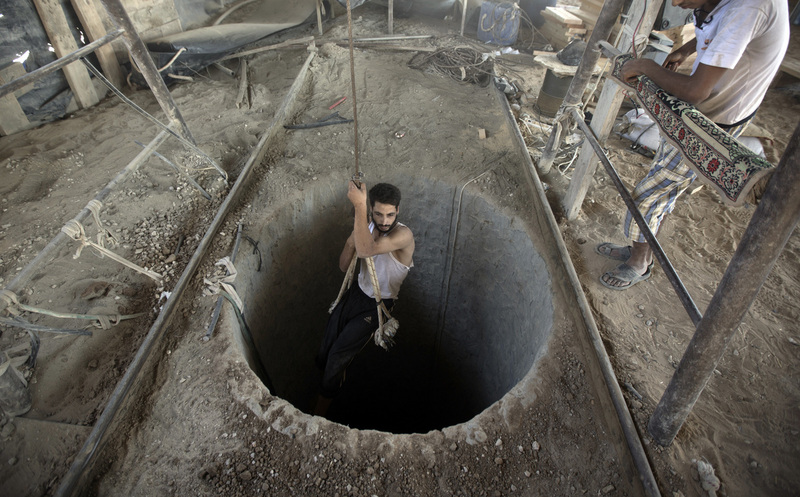 A Palestinian man is lowered into a smuggling tunnel that runs beneath the Egypt-Gaza Strip border, on Sept. 11, 2013. For the past year, Egyptian forces have cracked down on smuggling tunnels which Gazans used to import a wide range of goods, including weapons. The network of military tunnels snaking north and east into Israel were likely dug over several years. But they only began to be exposed in the past year or so, even as the commercial tunnels to Egypt were being shut down. Heavy flooding last year revealed some. The Israeli military found one last fall near a kibbutz and much bigger one this spring. Extensive Israeli media coverage may have helped cement worry of infiltration in the Israeli public's mind. In retaliation, Israel stopped permitting concrete to be brought into Gaza — a concession that had only recently been won. These militant tunnels are not mole holes. Some are tall enough to stand in, reinforced with concrete and equipped with electricity and phone lines in some cases. Over the past week, Israel said its troops had at least two separate firefights with militants coming out of tunnels into Israeli territory. The military said weapons, Israeli uniforms, plastic handcuffs, and tranquilizers have been found in tunnels — tools for both potential attacks and potential kidnappings, Israel says. One of those tunnels emerged near Israel's Kibbutz Nir Am, a lush gated community just a few hundred yards away from the northern tip of the Gaza Strip. Five Hamas gunmen shot dead four Israeli soldiers before they were killed themselves in a battle Monday. "Sometimes I do my Saturday walks, I go there, and never imagined that there would be, maybe on some paths that I was walking, an opening from where terrorists could just come and attack me," said Israeli Ben Hillel, a resident of the kibbutz. "They had heavy ammunition ... so they probably wanted to enter one of the kibbutzim — in this case our kibbutz — and kill people." The Israeli military on Friday showed journalists another tunnel in the area that had been uncovered two months ago outside Nir Am. The tunnel was lined with concrete plates and was big enough for armed men wearing body armor to walk through, single file. Israel says it did not realize the scope of the tunnel network until it got troops on the ground last week. This has been described by some as a "resounding security failure" demanding a public inquiry. But before that, Israel insists the tunnels must be destroyed for peace. Mkahimar Abusada, a Gazan political analyst says Hamas may accept that if it includes a long-term truce and opening Gaza's borders, the militant group's central demand. "If there's going to be a long ceasefire and there's going to be an end to the siege on Gaza, why would Hamas need those tunnels anymore?" he says. But he also says the fundamental Palestinian goal of an independent state must be addressed for tunnels to stay shut down. "It's not like Hamas is going to liberate Palestine by tunnels," he says. "This conflict is going to explode again and again if the roots of this conflict are not resolved," he said. Emily Harris has been covering the Israeli-Palestinian fighting from Gaza. Follow her @emilygharris. Soraya Sarhaddi Nelson and Daniel Estrin contributed reporting from Israel.